In early February 2014, Tamara, a friend of Anna and Barry, visited the horses to practice her photography skills as horses are notoriously difficult animals to photograph. As she clicked away at Sparky, Flynn and the other horses who shared the paddock with them, she asked after the various horses and their individual stories. Just as she was finishing up, a spotted gelding – an Appaloosa – whose name no one knew, came up to say hello. Anna began to rattle off his story – a story that epitomized the saying that “a horse doesn’t have to be skinny to be neglected.” As Anna retold the nameless Appaloosa’s story, the voice that had spoken to her earlier spoke again – “this is the next horse” and suddenly, the “closer than what you think” statement made sense. The Appaloosa had been sharing the same paddock as Sparky and Flynn for the past 12 months! 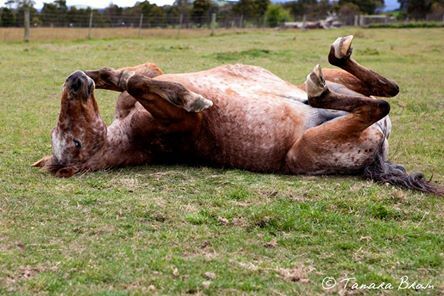 Over the next few weeks, Anna tracked down the owner and negotiated the purchase of the spotted gelding. The nameless horse was given the name Charlie Bronson and at the end of March 2014 became the first official “rescue” horse of Spark of Hope.The next few months saw a flurry of activity as Charlie underwent a horsey makeover – hooves that were overgrown and misshapen were brought back into a healthy shape, teeth were rasped, vet checks were undertaken, vaccinations were given – he even had a number of horsey massages! All of this provided ample opportunities for us to learn about the spotted horse while he learnt what it meant to be cared for again. It has been a journey with a lot of ups and the occasional down, but in the middle of it we have come to appreciate the tenacious spirit that this horse possesses.Trusting, relaxing and letting go have been some of the lessons Charlie has had to learn, and has in turn, taught us.